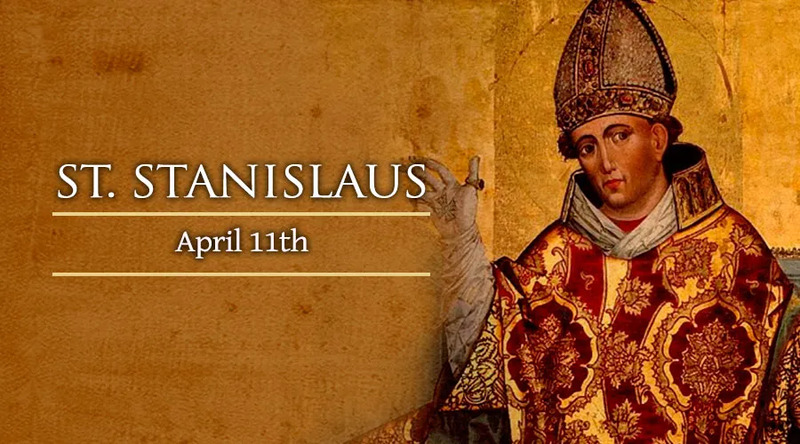 On April 11, the Catholic Church honors the memory of the 11th-century bishop and martyr St. Stanislaus of Krakow, who died for the faith at the hands of King Boleslaus II. Canonized in 1253, St. Stanislaus is a beloved patron of the Polish nation and people. In his own country he is commemorated May 8, the date of his death in 1079. Born near Krakow in July of 1030, Stanislaus Szczepanowski was the son of Belislaus and Bogna. His parents, members of the nobility, showed great zeal and charity in their practice of the Catholic faith. Their son studied for a time in his own country, and went on to learn theology and canon law in Paris. The death of his parents left him with a large inheritance, which he gave away to the poor. After his ordination to the priesthood, Stanislaus served Church of Krakow in different pastoral and administrative posts. Following the death of the diocese’s leader, Bishop Lambert Zula, Stanislaus was chosen as his successor in 1071. He did not want the position, but obeyed Pope Alexander II’s order to accept it. Having done so, he proved to be a bold preacher of the Gospel. This boldness brought him into conflict with Poland’s ruler, King Boleslaus II, who was becoming notorious for his violent and depraved lifestyle. After a series of disputes over his scandalous behavior and other matters, Stanislaus found no success in his efforts to reform the king. He excommunicated the sovereign – who responded with furious anger, sending henchmen to kill the bishop. When they proved unwilling or unable to do so, Boleslaus took matters into his own hands. He ambushed Stanislaus and struck him down with a sword during his celebration of Mass. St. Stanislaus was soon acclaimed as a martyr, while Boleslaus II lost his grip on power and left Poland. In later years the fallen monarch is said to have lived in a monastery, repenting of the murder.